Control MIDI devices and software with the electrical signals from your brain! Several years ago, I was watching Dateline or some other newsish program when I saw a story where paraplegics were using a cap with a bunch of electrical contacts hooked up to a computer to move a box around on the computer screen. Seems that with enough practice, one can gain some control over the elctrical signals that can be picked up through the skull. The type of device necessary for this is called a non-invasive brain-computer interface, or BCI. When I saw this, I had some ideas about how cool it would be to control synthesizers rather than this box. A couple months ago, I saw one of Alan Alda's PBS shows with a similar story. I decided to do some digging to see if any commercial BCIs were out there. After a couple weeks of Googling and learning, I came across this device created by OCZ. They call it a Neural Impulse Actuator, or NIA. The device consists of a headband that has three sensors. 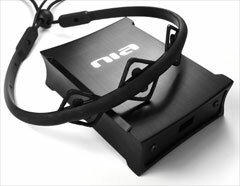 The headband is hooked into a box which samples the electrical signals and sends them to the computer over USB, not unlike a sound card. I've written some software to translate the signals that come from the NIA into usable MIDI messages that you can control almost any synthesizer with, whether that be on your computer or actual MIDI compatible device. I don't actually make or sell the hardware, you'll need to pick that up on your own. Amazon usually has the best price. You're looking for the OCZ NIA. Should work on 2000/Vista/Windows 7 but is currently untested. E-mail me with your results! This software is available free for non-commercial use. It is currently in beta, and not a finished software program. There are plenty of bugs, and lots of things to work out. Please e-mail me any feedback you have.